Over on BlytheKingdom folks have been having difficulties sewing sleeves in Blythe-sized garments. So I thought I would put together a tutorial - a very detailed one, with every trick that works for me. Sorry Imogen, but the tunic you are wearing has the sort of sleeves I'm going to show in this tutorial - set-in sleeves. 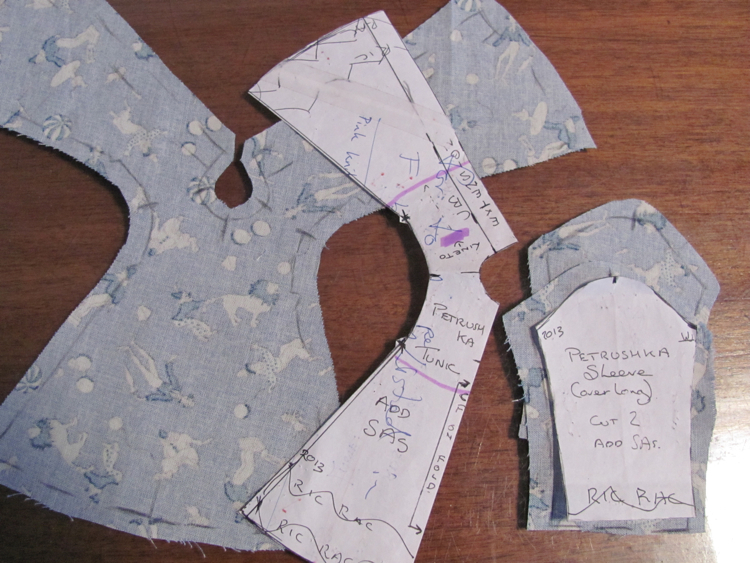 Here are the pattern pieces with cut out fabric. The sleeves have a sleeve-head shaping (a bit like a rounded mountain) similar to sleeves for human clothes but there is no difference between the front sleeve and the back sleeve (makes things simpler). Note that the tunic dress is cut in one - the front and the backs together. Thus eliminating the shoulder seams. 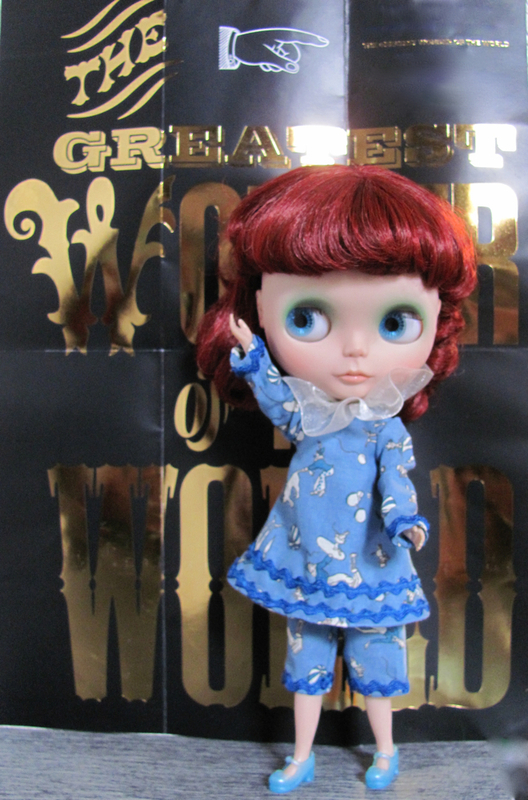 This wastes some fabric but with such tiny garments it is good to eliminate those seams and all that bulk ... shoulders can be really fiddly and bulk there is not attractive especially as Blythe doesn't have a very long neck. You can see that I've marked the stitching lines and I've marked the top point of the sleeve heads on the sleeves. 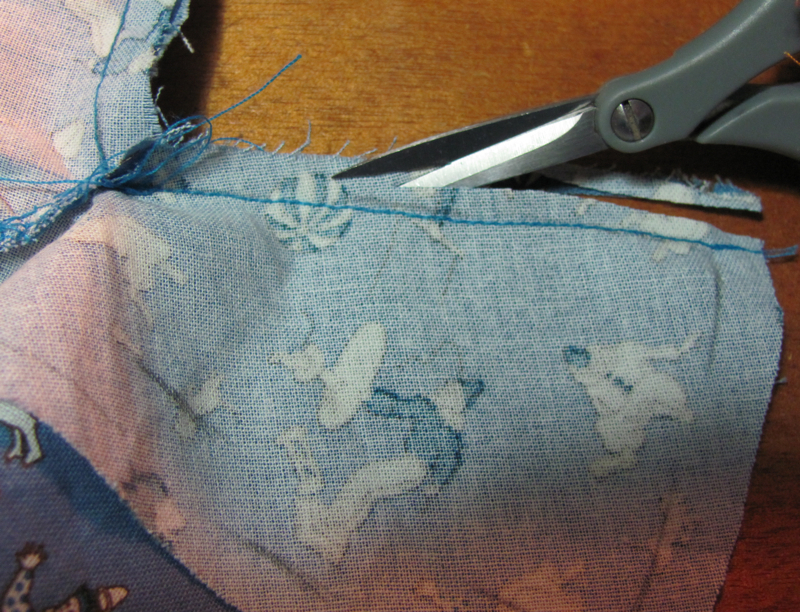 On the tunic, I've marked the shoulder (where the seam would've been) and those > shapes mark the underarm points. Yes, I've used lead pencil - an HB - it washes out of most fabrics and you can get nice accuracy. First pin accurately matching those points at Underarm and at the top. An Aside: for dolls we need to be quite accurate! 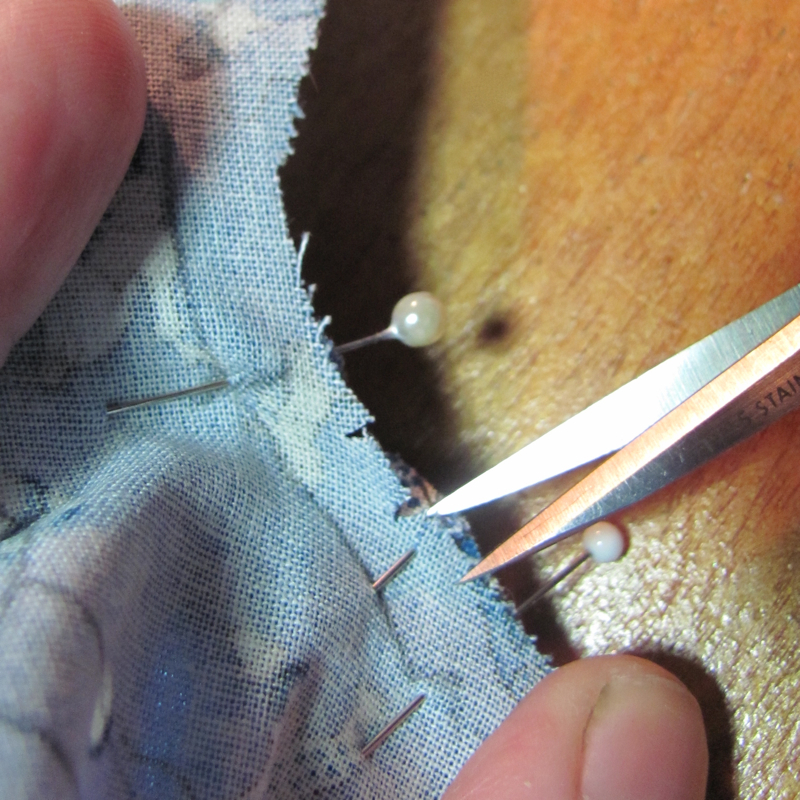 and then push the 2 pieces of fabric together firmly before angling the pin to push it through the fabric again. 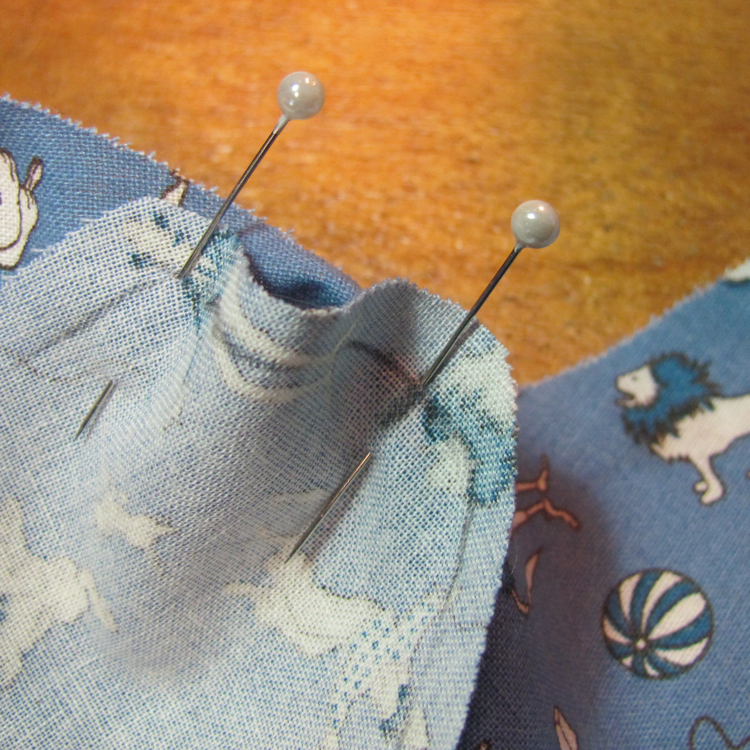 When those 1st 2 pins are accurate, arrange the rest of the sleeve, matching the stitching lines. You will probably have trouble getting the stitching lines to match (we are trying to match a convex curve to a concave one!) 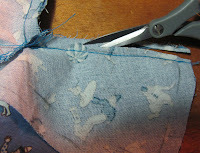 you can snip the fabric - go only halfway to the stitching line, make multiple snips rather than 1 big 'un. 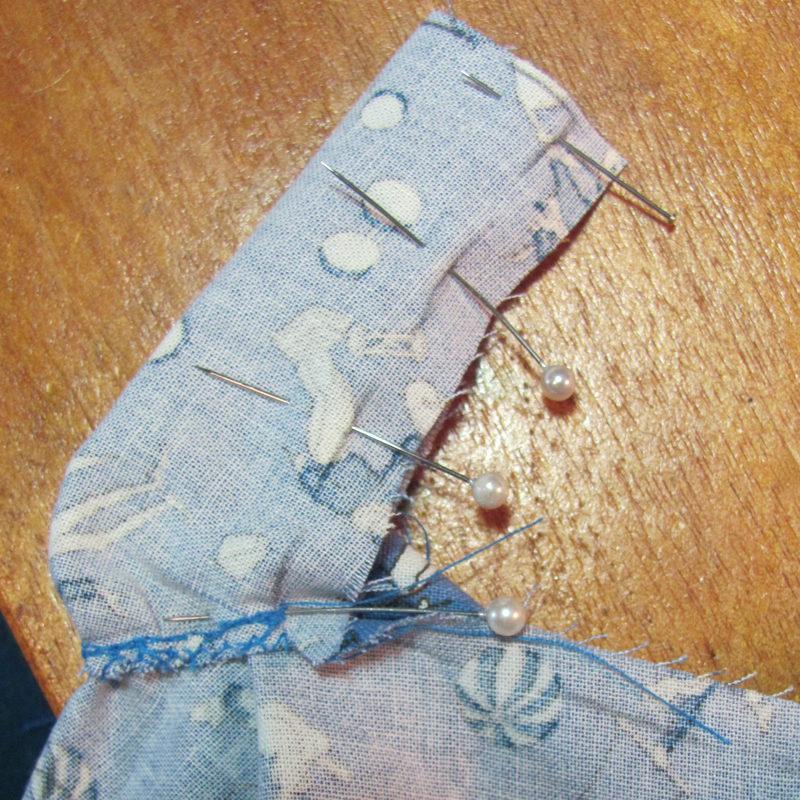 Sleeves are often fuller than the bodice armhole - I'm making little tucks at the top of the sleeves. 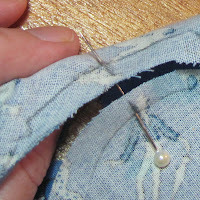 You might like to make gathers, in which case you would run a gathering thread next to the stitching line (in the seam allowance). Use a long stitch length on your machine for this and only gather the top part of the sleeve. If you want a smooth sleeve head (without gathers or tucks) your sleeve should be only slightly larger than the armhole - and you can ease the extra fabric in where the fabric is on the bias (on the slopes of the 'mountain'). 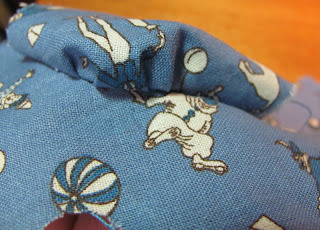 But back to our sleeve with tucks - and here is the first half all pinned. 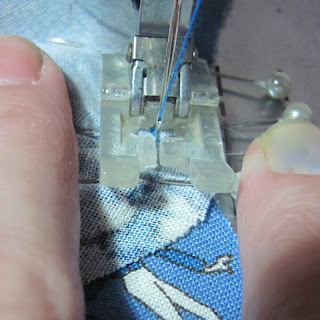 Take your work to the machine and hand-crank the needle down at the underarm point (we don't want to sew beyond the underarm points - or we'll create bunching there). Machine, starting with a little back-tacking. 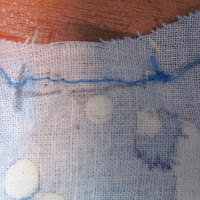 The Sleeve should be on the top - it is harder to be accurate but if the sleeve is beneath it is almost impossible not to catch it into the stitching in the wrong place. Another aside : You'll have noticed that my pins are sideways to the direction of the sewing? This way you can, if you have to, sew over the pins. 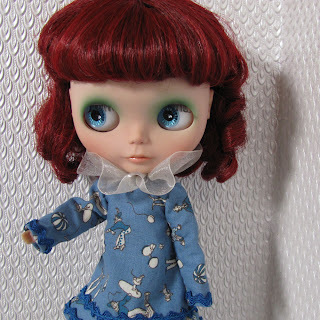 Not the best thing to do as it can make the stitches less accurate - but sometimes with tiny Blythe garments it is helpful because you can use those pins as "handles" or "pushers" to get the fabric to go under the foot and get sewn !!! Another trick - If you have trouble at the start of machining - with these tiny seam allowances, the needle pushes the fabric down the hole in the foot-plate !! It happens. 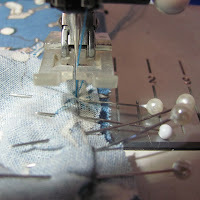 If your stitching is as wobbly and off the stitching line as that is - unpick and do it again. 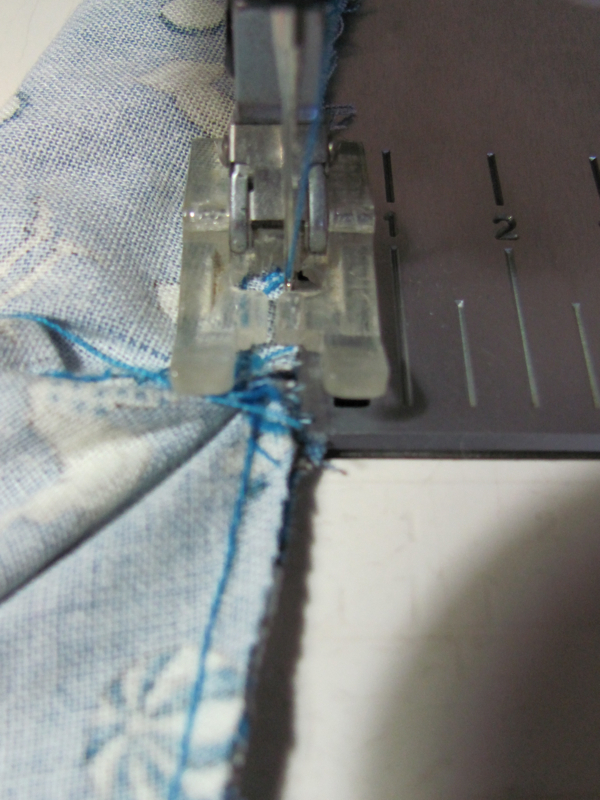 Because I always need to unpick at same stage I don't like to use too small a stitch on the machine - on my machine I set the length at 2 (in sewing for humans I would use 2.5 to 3). 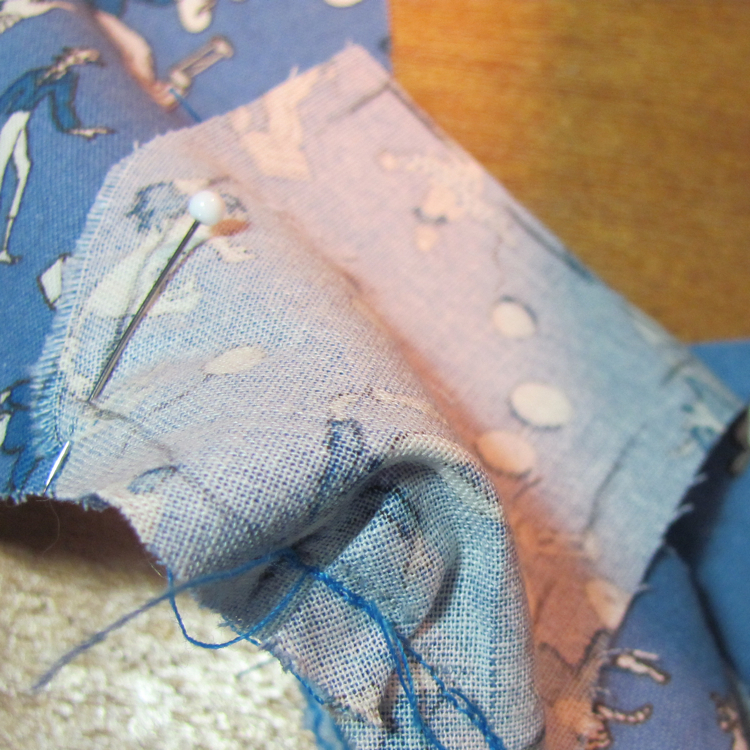 When the first half of the sleeve is done, pin the other side - matching the underarm points and then pinning the fabric in-between. Machine the 2nd half of the sleeve. And some thoughts on neatening. The purpose is to stop fabric from fraying away - the down-side is that you can create bulk - nasty thick, stiff seams. Some fabrics don't fray - Yippee if you are using one of them! But most do and this cotton definitely frays. Some folks use Fray Stopper - I don't because I suspect that some types interact with dolly plastics & it is messy & it makes the fabric stiff. Some folks use an overlocker - I don't often with doll clothes, they are just too small & fiddly & overlocking can be thick and bulky. I've found the best method is a small zig-zag. 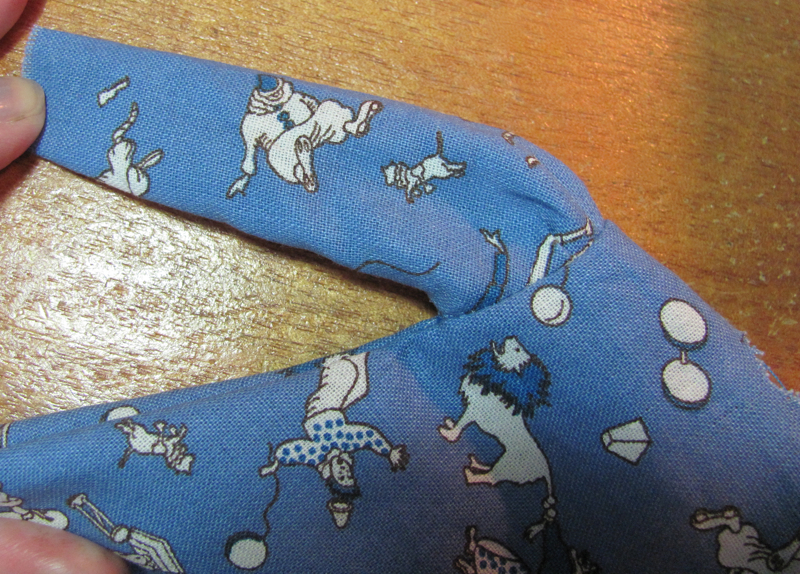 Cut the seam allowance down to about 1/4 inch or 3mm. 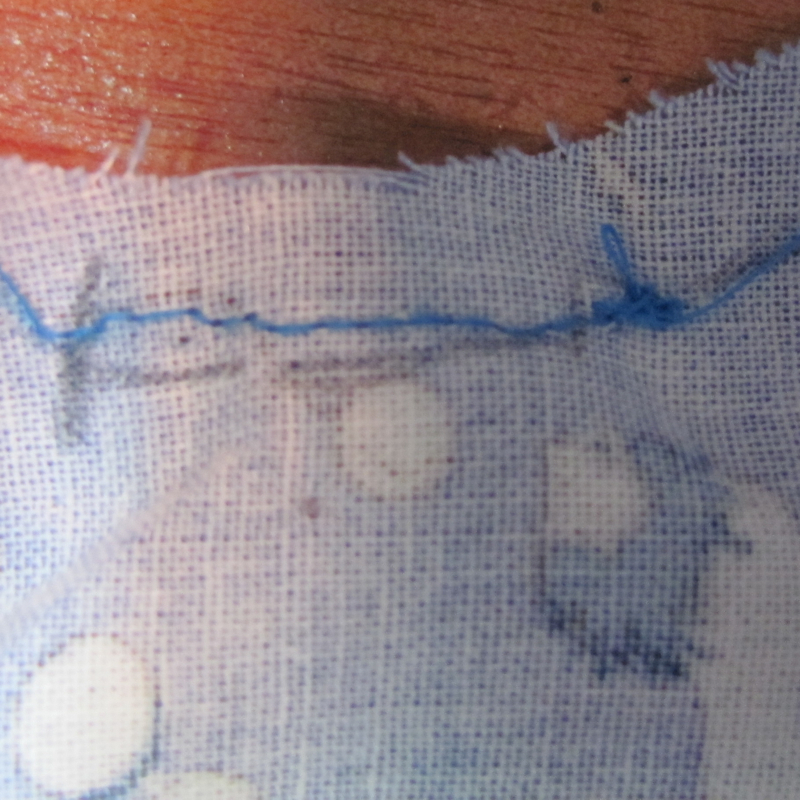 Set stitch width for a small zig-zag (2 on my machine) and shorten the stitch length slightly). 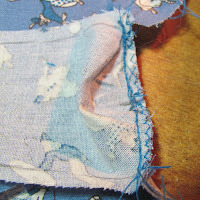 If you can drop the needle just over the cut edge or on it - you create an overlock effect. Remember to restore the machine settings after zig-zagging. And here is the sleeve sewn onto the bodice ... sew the second sleeve as for the first. At this point you might like to hem the sleeves (at the wrist). I'm not doing so on this tunic, I'll hem by hand because of the ric-rac trim. Now to sew the sleeve seam and the bodice / tunic seam. Once again I do this in 2 parts - to avoid catching the seam allowance from the previous seaming at the underarm and making bunching there. 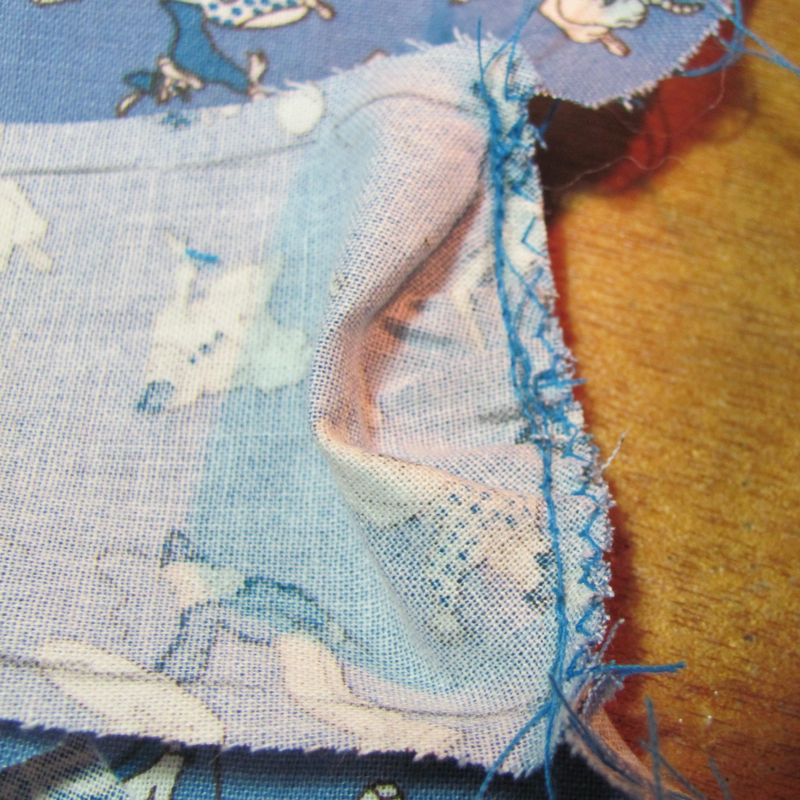 Stitch going to the previous seam's stitches at the underarm - but not beyond. 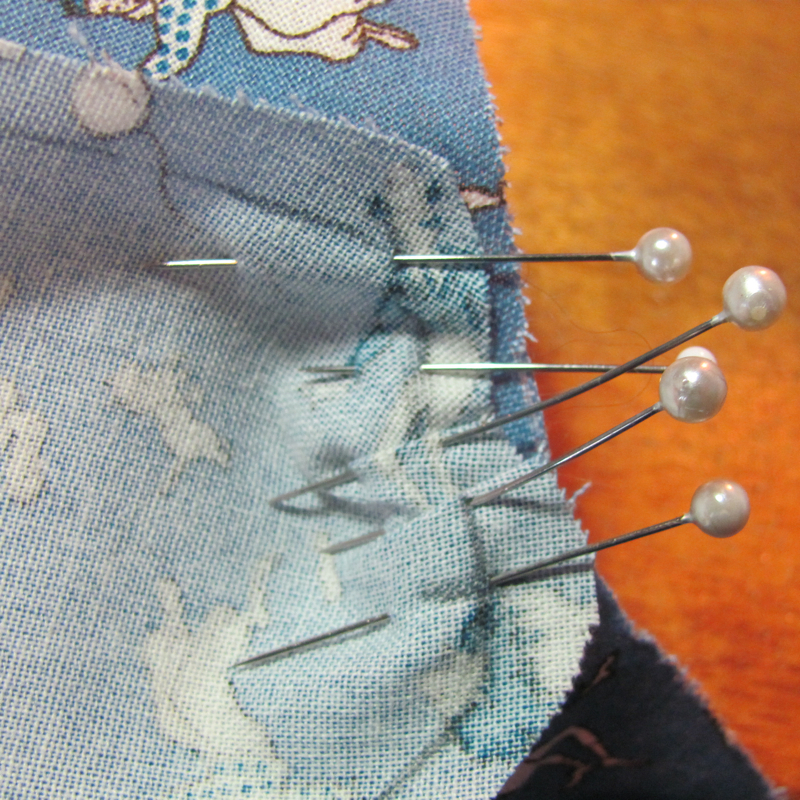 Do a little back tacking at each end. 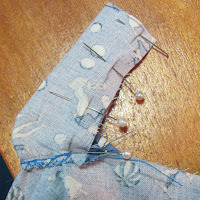 Then pin and seam from the underarm to the end of the tunic or bodice. Take care to hold the garment with the edge quite straight (no angle at the underarm) to avoid catching that seam allowance and making the dreaded underarm bunching! PS: If anything is too confusing - please leave me a comment and I'll get back to you & try to explain. I am so grateful for this tutorial! Thank you! Thank you for the tutorial! Very helpful.